Design your own fabric labels for crafts, handmade and your homemade fashion garments. Made from beautiful smooth satin with a full colour permanent print, they're the perfect way to build your brand or simply add a finishing touch to your DIY projects. These crafts or clothing labels come in packs of 20+, flat or folded, and there are 12 sizes to choose from. These stunning satin fabric labels for clothing, crafts, and other branding purposes add an extra special element to your handmade items. There are 12 size options, allowing you to promote both big and small products, and your custom fabric tags come in packs of 20, 40, 100, or 200. There's no minimum order, which is perfect for small DIY projects or if you're just setting up a crafts business. Choose from folded or flat labels and create your own kid's name labels for their clothing, or simply add an extra professional touch to your homemade goods. Loved the quality of my fabric labels. Fast postage and easy to order. Great labels. Thrilled with the order. Easy design and online ordering. Fast and efficient ordering and delivery. Has a closed edge and the cut edge is to be sewn in. 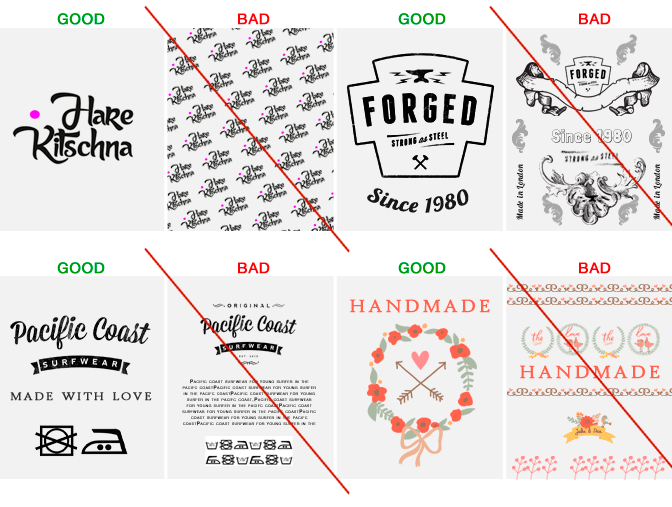 If you are choosing this option, see how to position your design on a folded label. Has heat sealed cut edges. The ends are meant to be folded as we don’t achieve a skin side finished edge, it’s just sealed to be non-fray. All the flat labels, or custom fabric tags, have +1cm seam allowance added to each side (on top of the stated fabric label size). You can sew flat with no fold. *Dimensions are approximate, as bleed areas need to be accounted for. Please note: Whilst we use a woven satin fabric, your labels are not embroidered. They are printed on to give you the greater advantage of excellent colour print, full brand logo and better readability. When you come up with a product garment or soft accessory that you design and create, you need to get that finishing touch of your own brand label or name tag on it as soon as you can. A big problem you will face is minimum runs for custom labels especially custom tags for clothing, or custom shirt tags because you only need a small quantity. Woven labels for handmade items often only start at 1000 or 5000 labels and will cost a small fortune. You won't need that many at the beginning so why put that much cash into stock? Custom name tags also change. You might find you need to edit the design or adjust the tag name. Make name tags in short run, especially useful as personalised fabric labels for crafts and handmade items. Our minimum quantity is one pack of 20 labels that we will print and hand prepare for you. Use our custom printed fabric labels to get your designs started and on sale fast. As we produce in runs of 20, 40, 100, and 200, these are a great way to test the market without much cost or set up. You can design them online in a few minutes to see what they look like, and get them in a matter of days. If you need more, reorder is easy as the design will be saved in your account. In addition to these versatile labels we also offer swing tags no minimums that you can buy in matching short runs. We print directly onto the satin, locking the colours deep into the fabric fibres, creating a permanent print that won't rub off or fade away over time. We cut the satin to size and finish it to your specification - either folded or flat. Made from 100% polyester soft woven satin fabric, our full-colour clothing labels offer outstanding wear and abrasion resistance. The woven satin labels can be used on any type of garment from t-shirts and boxer shorts to jackets and footwear. 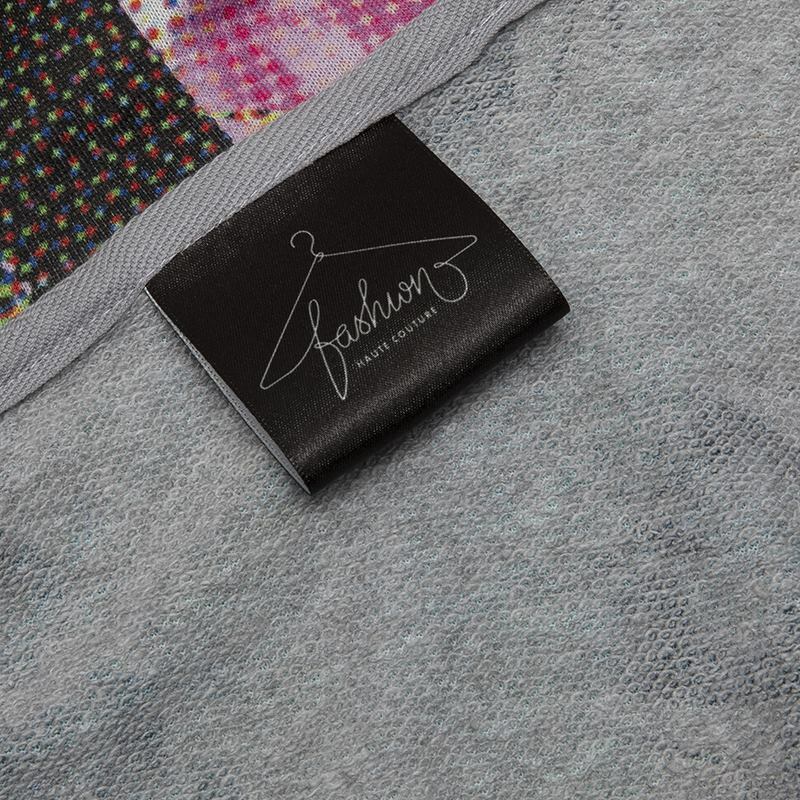 Due to the print quality of the fabric, our custom clothing labels display a smooth and soft appearance with lustre, giving the finished garment a rich feel. All labels have a thin black or grey cutting line so we can trim your labels to size. This will be sewn into your product so should not be visible in end use. Sewing clothing labels on your apparel will help your brand gain recognition. Our garment labels have been purchased by wide ranging designer brands and featured in thousands of collections. If you have your own logo or brand name, simply upload the image onto our design system, preview the label, and your garment labels will be on their way soon.